I use a manual wheelchair and am taking a Greek Islands cruise in a few months. I really would like to get off the ship and tour Santorini, but I’ve heard that there are a lot of steps to get to the top of the island. Do you have any suggestions for an accessible tour of the island? Unfortunately Santorini is not the most accessible port. First and foremost it is a tender port, and they use the local tenders which are difficult to board even for able-bodied people. And then there is the island itself, with the steps leading to the top. There is a funicular, and it does have a portable lift, but there are stairs to get to and from the funicular itself. Additionally, once you are on top, there are cobblestones and stairs all over. It is very difficult to navigate. That said, you might want to contact the folks at Himalaya Travel in Greece (www.accessibletravel.gr) to see if they can plan something for you. 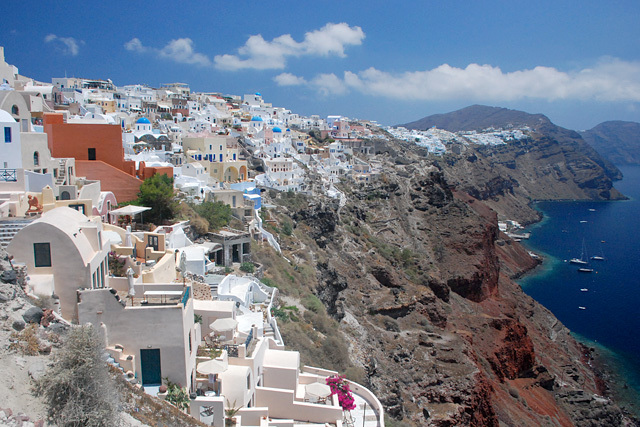 They are an accessible tourism agency located in Athens and they know the local providers, so they would be the ones to arrange the most accessible Santorini tour for you. ‹ Accessible Lodging Database Helps Travelers Find Appropriate Accommodations	› Travel with a Mobility Scooter?